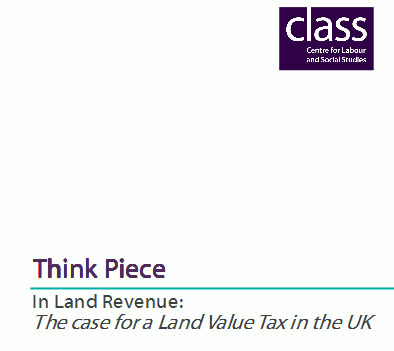 The Land Value Tax is an idea I’m quite interested in, and that I think needs consideration. (My introduction to the idea is here) It’s one of those ideas that has been discussed many times in the past and almost implemented on occasion, but never quite got underway in this country. It’s being revisited at the moment, and the latest contribution is from the Centre for Labour and Social Studies, a new think-tank that was founded last year. The first and most important reason for considering land taxation is that Britain has a housing problem. Many parts of the country have a shortage of affordable homes, and need to find space to build them. Despite the need, speculators continue to sit of large areas of land, hoping the economy will turn a corner and the value of the land will increase. In Luton, this has led to the crazy situation of local parks being given over to housing development, while vast areas of the town sit derelict. One of the worst aspects of this land hoarding in Luton is that it is a predatory way to make money. Those sitting on the unused post-industrial sites around the town are depending on others to invest. They’re waiting for the council and local businesses to invest in regeneration, and they’ll then sell up once the value of their holdings rises. A tax on that unused land would make it less profitable to hoard it in this way, and it would be released for development. This freeing up of unused land would be likely to lower the price of land, encouraging development and house building. This would ease the housing shortage, and could provide a more stable, less inflation-prone housing market in future. I won’t go through all the detail now, but if you’re interested in the idea, it’s worth taking a few minutes to read the briefing. It’s only 10 pages or so, and it’ll give you some context on how it could be applied, pitfalls to avoid, and other groups who are looking into it too. The case for a land value tax rests on the fundamental principles of justice and equity, and for reasons of administrative convenience, enforcibility and the fact that it does not lead to deadweight losses, in contrast to all other taxes. That is surely enough to be getting on with? This was the official policy of the old Liberal Party. They gradually forgot about it during the 1970s and dropped it entirely when they merged with the Social Democrats. It’s one of the reasons I left them after a period as group leader on Luton Council and twice Parliamentary candidate. As far as I can see the policy has such a lot going for it and almost nothing against, except opposition from the speculators. Very good idea. Free market liberals such as the ASI and the IEA have argued for this for years. The only difference is that the whole point is that is only works if levelled on all land, even those where ‘ordinary’ people live. Why should they gain from nearby development but not anyone else? What about gardens, are they counted as part of the house and untaxed or taxed as brownfield land (as they are classed under planning)? It is good that the left seem to have woken up to the idea but a shame they haven’t grasped what it needs to work. This is one of those good ideas that doesn’t belong to the left or the right. And it’s up for discussion – nobody’s got a proposal that gets down to the kind of detail you’re demanding. There are all kinds of ways of configuring it. LOL, you want to inflict another tax on someone else in an attempt to bring house prices down. You continue to surprise me with you naivety. How about you advocate for a smaller government and let people keep more of their money so they can afford to buy the things they want. Novel idea I know, but hey here’s hoping. Agree with you AdrianM on your point about a smaller government-massively too big and costly at present. Housing- there is a current requirement for more housing but first a stop on population increase is needed in this little Island-present immigration policies are an unmitigated mess.House prices will not come down. So no, not more taxes, different taxes. Agrees that a land tax is generally a good idea: it is working here in Germany, and helps pay for things like publc transport. But we need to have some kind of safeguard so that you don’t end up encouraging sprawl. The problem at the moment here is that the local government decides how much land will be classed a ‘building land’ and therefore have a higher tax rating, so they have an incentive to class more and more land as ‘building land’ because they can start charging the tax immediately. People who don’t want to build like allotment owners have to sell up or take out loans to build while others make a fortune by building and then making money from rents. The worst of it is that these new landlords then pass on the lant tax to their tenants, so effectively the poorer often end up paying for the rich to make more profits. BTW Jonarien: having tried to get my Japanese Wife into the UK, I can tell you that UK immigration isn’t the pushover the Daily Mail claims it is.